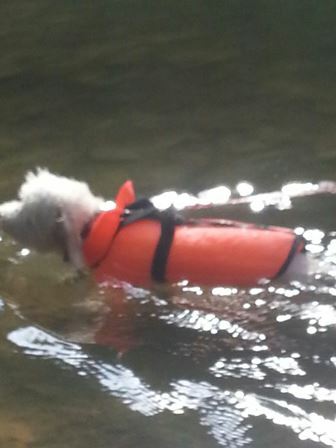 The ‘lil old dog was a trooper on Saturday’s surprisingly cool weather. It was actually a bit too cold to swim, personally, and made me wish I’d had a big towel or t-shirts to keep Pocky warm. Luckily, the sun was shining bright and dried us off relatively quickly. He likes to sleep more, peek his head over the edge of the boat and settle into laps more than jumping into the river but he still smiles like crazy being outdoors. I’ll take him out as long as he doesn’t seem distressed. The Blue River can get notoriously shallow causing people to get stuck and carry their canoes or kayaks along stretches of the river. Not the case here. In fact, there were good, long sections of rapids and we finished the river in 2 hours and got to the graduation party just in time. Normally, we’d do the 13 mile trip but we only had time for the 7 miler and we made it a workout. My shoulders and triceps are paying for it and made for a super crappy swim on Sunday. 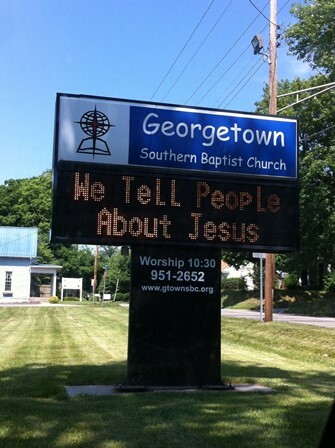 On the way back from canoeing, we saw a huge church sign that was huge and eye catching on the country roads . . . 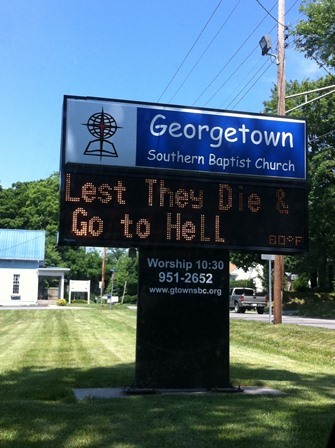 Nothing like the threat of everlasting hell to summon a person to worship.